This page forms part 2 of our Samsung smartphone review. Reviewed March 2013 + later updates within. First up you'll need a Google account, if you don't already have one it's easy enough to do on the mobile device when launching Google Play for the first time. We ran into a little problem here as it didn't recognise our existing Google account of eight years standing, so had to set-up another one, which, OMG, came with another (unneeded) gmail address. Once registered though it's simply a matter of browsing the extensive Play store, checking out apps that appeal, reading user comments, app ratings and screenshots; and clicking 'install'. Many Android apps are free (often supported by advertising), others cost a small amount. We prefer studying Google Play apps on a larger computer for ease of reading, and if signed in with Google account they can be sent straight to your Android device. Just quickly at this point: the mobile device's Applications Manager is used to manage installed apps, check app version, clear data and the apps cache. You'll find it in the settings menu of your Android device. The following Android apps are a selection of ones we've tried. While perusing, please remember that the world of apps is constantly evolving; apps come and go, get updated, some improve and some worsen, and you may well find better ones. And also remember, these are ANDROID apps; not Apple iPhone apps, not for Blackberry or Windows phones either, although some have other mobile device versions too. OK, so let's take a look at some of the Android apps we've used, together with our tips. We'll probably add to this in time as we discover more juicy Android apps! Updates: look out for these below our Android apps reviews to check how we find them developing over time. There are also users' comments on the apps on Google Play but be wary - users ignorant of settings or how-to-use can condemn apps unfairly! Now we've seen discussions on whether a security utility is really necessary on a mobile device, there are a number of highly rated anti-virus apps on Google Play and we plumped for Avast because that's what we use and trust on the PC. There's a virus scanner and firewall, shields for web/email and the installed apps, plus an anti-theft program and useful functions such as a network meter and privacy adviser. Our tip: the firewall doesn't function without root access to the smartphone which our Samsung Galaxy doesn't. Update Mar '14: works well, various improvements over the year. Update May '15: recently an update decided it couldn't install, and caused the play store to lose its list of our installed apps. However Avast quickly released another update which fixed things. Update May '16: no issues, frequent updates and works well. This can scan both QR codes and normal barcodes using the device's camera for instant decoding or storing, and a saved QR image or code URL decoded. A barcode can be entered manually, and QR codes created. Our tip: most QR codes we've scanned out and aboutUpdate May '16: keeps notifying of update but then says our device is incompatible! But works well despite this. carry a URL so a network connection is needed, or store and decode later. Update Mar '14: updates have changed the interface and operability for the better. Update May '15: various UI changes and extra app functions. Update May '16: regular updates, new look UI, various sorting functions. Show it a photo of a distinctive building, landmark, product, book, logo, etc. either from the phone's camera or photo gallery and have Google tell you all about it. It can also decode QR and barcodes and translate text. Well, we threw it some 'live' on our 2012 travels and from our extensive tourism image galleries; while it correctly identified Brighton Pavilion, Stonehenge, Glastonbury Tor and the Isle of Wight Needles it failed with the iconic Lancaster bomber and Cornwall's historic coastal mining towers. Our tip: don't expect miracle matches as it's pretty hit and miss. The 'visually similar objects' it comes up with as alternatives are farcical, such as images of clothing in place of those mining towers! Doh! Update Mar '14: simplified operation but the recognition ability is no better! Update May '15: not seen many updates recently. Update May '16: not getting updates on our old Android 2.3.6. This is far better than most mobile devices own Wi-Fi control, what with its easier-to-view light skin, three ways to display signal level (bars, percent, dBm), channel number and network state display, and previously connected to networks store plus sorting and scanning options. Screen widget options provide a variety of network info including speed. Our tip: use the radar display to identify the best channel to use at home/office as it shows overlap extent in saturated Wi-Fi locations. Update Mar '14: can now assign own icons and descriptions to replace convoluted network names and there's now a useful single-tap network switcher. Update May '15: many behind-the-scenes changes and some extra widgets. Update May '16: some changes to settings, runs fine. Right. Wi-Fi manager showing available Access Points and status. Really a slimmed downed version of the desktop GE showing the familiar satellite view but using your current location (or searched one) to display the map. Pinch and twist gestures control the view which annoyingly slants while dragging but is easily corrected with a touch of the compass symbol. A drag-up panel (well, that's what we call it!) shows a selection of local images. With only sevenselectable layers it is slimmed down though. Works well enough but the stock Google Maps app does much the same thing. Our tip: as the map is cached until user-cleared, scroll it around the area you're visiting to cache it before leaving home. But clear this later - there's no option to use the external memory card and it quickly chomps through limited phone memory! Update Mar '14: now has a tour guide and 3D imagery. Update May '15: we don't use Earth much now as the Maps app does much the same. Update May '16: no updates for our ancient device system. If you read our smartphone review you'll remember we were disappointed with the smartphone's pre-installed Google Navigation app. So we came up with this app which had the offline functionality we required. We downloaded the UK & ROI map (260MB!) plus the UK postcodes database and 'Kate' and 'Dave', the English speaking voices for turn-by-turn guidance. The app can work out a route from a postcode or address, or a destination searched for and pinned on the map. Options include: vehicle type; such as car, truck or walking; and fastest, shortest, economical; and avoid tolls, motorways. Speed camera warnings can be set too and the route previewed. Your home location can be saved, as can favourites and recent destinations are stored. The map can be set to 3D or 2D view and to zoom in at junctions, and overlaid info includes current speed, distance countdown-to-turn and ETA or time until arrival. It also shows points of interest (POI) and the many POI categories can be toggled on/off. A neat feature is that nearby POI's can be searched (offline too), so you'll be able to find the nearest café after your journey! And it all worked very well, the map and direction arrows keeping up with driving progress, and another neat touch is the auto-night mode when the map changes to a darker version at sundown. 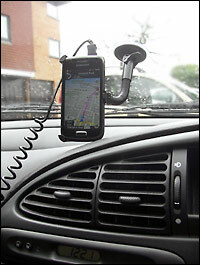 Car mounted smartphone in Sat Nav mode. We prefer it vertical to see more of the route ahead, but the power lead is a bit of a stretch. So are there any shortcomings? Well, yes, a few. We first used it on our 2012 Wiltshire holiday and generally Navfree World worked really well, journey-time estimations were pretty good, although it sometimes took a while to reroute if we dared to stray from that calculated. We found the speed camera/speed limit is not shown without a network connection (fair enough), and while not the app's fault, our smartphone's top positioned mini USB power input means the necessary (because the GPS and screen's on constantly) curly car power lead is a bit of stretch. Oh, there's no pinch-to-zoom on the map, it has + and – buttons instead which is less intuitive driving. And what about pedestrian navigation? This is where it really falls down as it steadfastly refuses to follow a trail when navigating in walking mode, instead stubbornly trying to redirect us to the nearest road. Also the map can lack detail out in the sticks and many trails are not shown. Finally, it's missing features such as lane guidance, IQ Routes and HD Traffic but hey man, we're splitting hairs here - it's free... so not at all bad for that. Our tip: fine for casual use, but get a dedicated Sat Nav if you're a power user! Update June '13: a version update (& map update) has improved UI and walking mode, but substantially increased system memory demands. Update Mar '14: the memory zapping (above) was quickly fixed but other functions get screwed then fixed with each update. The 2D/3D map view switching is now more convoluted and a recent update rendered the stored map unavailable; we had to download it again. Update May '15: the latest updated version, Navmii, isn't compatible with our phone. Original still works well though. Update May '16: no longer able to update map, POI and postcodes database on our old phone version. Right. Walking at 2 mph the trail abruptly ends on the map, but continues on ahead in reality. Indulging our geocaching treasure hunting activity was a key reason for getting a mobile device in the first place, so we checked out the apps that could work offline and c:geo got good reviews and seemed to fit the bill. The offline map is first downloaded (400MB for Britain map!) and stored somewhere on the smartphone, we chose our ext. microSD. Next, (online) we entered our geocaching login, waded through the settings page, and used the search to find caches for our then forthcoming 2012 Wiltshire holiday. With GPS enabled, caches can be found for the local area, or the map scrolled to an area of interest. Cache icons are shown on the map, types filtered, and bulk-stored for later offline use; this stores the cache info, previous logs and photos, plus helper static map images. Caches can also be imported from a GPX file. After that the app can be used entirely offline, using the map and app's compass to navigate to the cache. Info displayed includes key cache data, bearing and distance to target. Once found, an offline log can be completed for later upload. Of course online maps can be used too, such as Google map and satellite view. We've far from covered everything the app does (eg. see radar mode in our next app review), but that's what c:geo does in a nutshell. So how does it perform? Actually, not bad at all, although we've had a few issues. Firstly, sometimes not all caches we know to be there in an area are loaded (yes, we checked we didn't have filters enabled! ), and sometimes the 'store for offline' is greyed out, then we have to painstakingly store each individually from the cache icon menu. We also found that when stored caches are dropped the associated files and folders are not actually deleted, as this chomps into the memory we delete these manually. And while not the app's fault, the battery is caned on a day's caching, what with GPS and screen on (with a high outdoor brightness) continually, we can easily get through three charged batteries. One final issue. Our old dedicated Garmin GPS receiver is designed for rugged knock-about outdoor use, our smartphone isn't, so care is required despite the rubberised grippy surround we fitted. But overall we're very happy with this app so didn't venture to try others, and as it gets frequent updates those bugs we highlighted may well be fixed now for our new 2013 caching season (update June 13: not fixed yet). Our tip: even when not geocaching the offline map facility is handy, just to pinpoint where you are. Update Mar '14: regular updates from the c:geo developer ensure this remains an awesome app. The ability to add notes now to each stored cache is a useful addition and the bug where not all caches were shown appears to be fixed. We've also downloaded updated OSM maps (from mapsforge) to keep things accurate. Update May '15: regular app updates to adapt to changes on the geocaching website and useful new functions such as showing the hint on the compass screen and distance/direction on map. One change we didn't like was the map no longer remains as last viewed and defaults to the middle of the sea somewhere! Update May '16: very regularly updated, the location problem (last, above) now defaults to our home location. This app was suggested by c:geo (above) as it integrates with it by providing a radar navigation screen so we gave it a go. But even as a standalone app we found it very handy as it shows the GPS satellites sky-plot together with coloured signal level bars showing status. It has an electronic compass, a magnetic field indicator, pitch and roll indicator and accelerometer. The radar can be used to set a target and return to it later, and needless to say it displays current GPS coordinates, speed, altitude, and DOP values (that's Deviation Of Position, yes, Mike got all technical and swotted up, it's basically a measure of GPS positional errors dependant on angles from ground position to satellite). Another useful function is the ability to update the smartphone's GPS chip with an A-GPS update; this allows for a faster initial GPS fix and increased accuracy in any app that uses GPS and is good for several days. Our tip: use the radar to find your car again in the vast theme park car park! Update Mar '14: GPS Status continues to run just fine, fairly frequent updates have added many settings options. Update May '15: changes under the hood and all is good. Update May '16: still a great app. A very comprehensive navigation app which can record your route and show it on a map, waypoints, routes and tracks saved and imported/exported in KML or GPX format, eg. for viewing in Google Earth. A dashboard can be customised from some 45 data widgets (with key ones below the map) with values such as speed, distance, average, ETA; even sunset and a stopwatch. There's a compass, satellite sky view, graphing of speed and altitude over distance and an interesting camera implementation. We really thought this app was going to be a brilliant replacement for our old Garmin Legend GPS receiver. So you can imagine our disappointment when it failed to deliver - it even had Mike crying into his beer! Firstly we encountered problems adding the data widgets, or rather changing their position. They couldn't simply be dragged over, we had to remove, then re-add to required position. And this wasn't easy as the 'remove' icon didn't line up with the bit of screen estate where it actually removed. Then it proved impossible to calibrate the compass, no matter how much we rotated the smartphone through all its axis' (we sure got some strange looks doing this!). Then there's the small sized saved track details which can't be enlarged. But the real deal breaker was when we couldn't get it to work with the offline map, doh! There's been some app updates over winter, so maybe things are fixed. If so then this could be a very fine navigational app indeed! Our tip: check back here around May (2013) and we'll let you know if it's been fixed. Update June '13: we've not revisited this app yet as My Tracks (below) fulfills requirements). Update Mar '14: we've still not revisited this app, although the app is well liked in the Google Play community. Update May '15: can't comment as we've not used app since. After ditching GPS Essentials (above) this was our next choice. The app records your path with a breadcrumb trail using different colours depending on customisable speed bands. It shows some 15 data fields such as speed, distance, elevation and times; and charts (see photo) elevation and speed over distance (customisable too). And it announces key data like distance travelled and average speed at time or distance intervals (yes, customisable). And this is cool; it integrates with Google Earth (if installed on your device) to fly you through your route. Tracks and stats can be saved as GPX or KML files for viewing on your computer's GE and saved tracks can also be aggregated, handy for combining several days walking for example. And it all works extremely well! Clearly some real thought has gone into this app, it can even preserve a track being recorded over a battery change. And it puts an end to disputes like how long you spent in the pub on that trek or what time you left so-an-so point as the track's timings are preserved for later analysis! The app is also aimed at fitness enthusiasts as it can sync via bluetooth with biometric sensors to record heart rate and can share created stats via social media. While it doesn't support offline maps, the Google maps it uses are cached, it seems in perpetuity. So using Wi-Fi we cache the map of our proposed area of activity in the app before leaving home and use it to record a day's walking activity. Our tip: hey, all you walkers and cyclists out there, you'll love this app! Update Mar '14: My Tracks only gets better, it can now play more than one track in Google Earth. Update May '15: tracks now exported as KMZ. We've suffered several non-resumes of track recording after battery change. Update May '16: our phone is no longer supported by this app so no updates but it continues to work well. Having an electronic Ordnance Survey map with us on our mobile device sounded wonderful - no more fumbling with large paper maps when out walking the trails! So we went straight for the paid version (£1.99) as it promised map caching for offline use. But despite indicating a cache size in the memory, it failed to load any saved maps and greeted us with a black screen instead. The OS maps it displays when online are fine (even if they take a while to load), markers and paths can be overlaid and maps can be shown for current location or searched by Grid Ref, postcode or inputted GPS coordinates. We found a workaround by taking screenshots, but the app's largish map overlays, such as zoom and refresh icons, can't be disabled so block map detail. And there's been no updates for this app in the 9 months we've used it. Our tip: it's pants, don't bother with the full paid version (but try the free app first)! Update June '13: despite an app update since review it's still pants! Update Mar '14: only one update since and all that did was rename this to UK Atlas. We looked at OS MapFinder as an alternative but that was a disaster too - bulky, clunky, poor functionality, frequent crashes and pricey at £2 for tile (map) for just a small area. Update May '15: app no longer seems supported by the developer; no updates since last. Update May '16: splurge of updates since last, but icon disappears from home screen and initial black screen on launching (although works fine on our more recent tablet). Skype is ideally suited to smartphone use, after all it's a communication utility allowing free Skype-Skype calls, with video, to be made. With Skype credit you can also call and text landline and mobile numbers at cheaper rates (as you probably know!). One thing missing is the Facebook integration that the desktop version has, and we find the UI (user interface) not particularly well thought out. Oh, and it shows up the low resolution of our phone's front camera. But it all works well, after signing in with your Skype account in the app you stay signed in for next time. We did encounter one problem when our outgoing video showed mostly a blue screen with just a hint of image along one edge, but this was quickly fixed by an update. And usefully the video can be switched between the front and rear camera. Our tip: use Wi-Fi for the required online connection, using the mobile network you pay for the data one way or another and defeat the object of free or cheap calls! Update Mar '14: things get fixed and other things get broken with various updates. Currently the biggest bug for us is the similar pastel blue colour number text as background making it very difficult to see to enter a phone number. Update May '15: mostly OK, except one time we couldn't hang-up a call when the app crashed and had to turn phone off/on to end call! Update May '16: no issues and runs well although we only use for calls to landlines/mobiles (use tablet for Skype-Skype calls and video). We tried three RSS reader apps (including the renowned RssDemon) but this was the mediocre one we stuck with. It tends to duplicate items when refreshing as it fails to ditch those previously displayed, randomly fails to fetch all in a feed and randomly displays them out of order. Maybe boring old RSS has had its day in these days of Twitter... Our tip: if you can do without it, don't bother. Right. Our own humble micbinks RSS feed shown in the Aggregator app. It displays the familiar London tube map of course and uses the GPS to locate your nearest station. It can work out a route incorporating line changes, and with a network connection gives current service status and tube tweets. And it also integrates with the Oyster card. Our tip: indispensable for all who use the London Underground... how on earth did we cope before smartphone apps! Update Mar '14: some subtle improvements but they've ditched the Oyster card integration. Update May '15: ditched this app now as it became plagued by ads obscuring the map rendering it unusable. Here we have an electronic clubcard for scanning at the checkout, points total, vouchers viewer and rewards ordering; a store finder, groceries order, recipes and cooking tips and, of course, Tesco Direct online store. But apart from the clubcard barcode it largely mirrors the mobile website, apart from not having to login each time. And it doesn't integrate with other Tesco aspects, such as NFC payments or their in-store scan gun (Mike challenged store staff on this, much to Belinda's embarrassment!). Our tip: use the mobile version website instead, which works faster anyway. Update Mar '14: sadly this one's deteriorated in many ways in the last year. One update even required us to re-enter our clubcard number rather than carry it over to the new version - not very user friendly! Update May '15: all's well again, we like viewing the nicely laid out latest store deals. Update May '16: keeps notifying of update but then says our device is incompatible! But works well despite this. As you can imagine, there's plenty of mobile device apps for social media networks! We've tried the apps for Twitter, LinkedIn, Facebook and Flickr and all work in a similar fashion - they store your account login, you can get new post notifications, check/post/share, upload stuff and update your profile. They all have their quirks though - we've suffered frustrating app crashes, not all content being displayed, and upload failures. Our tip: handy if you get withdrawal symptoms if more than an arm's length from your favourite SM place, but the mobile version website of each often works better. Disclaimer: we don't necessarily endorse these Android mobile device apps or whether they'll work on your own device. You should always evaluate apps yourself and make your own decisions as to an app's suitability. micbinks disclaims all responsibility.